Rahul Shamrao Banarase Associate Professor, Dept. of Rachana Sharira, Ashwini Rural Ayurveda College, Manchi Hill, Sangamner, Ahmednagar, Maharashtra, INDIA. The human anatomy (Shareera Rachana) is an important for allied health sciences. It is one of the fundamental subject to the health science. Acharyas like Sushruta, Charaka and Vagbhata were given importance to the knowledge of Rachana Shareera. Tarunasthis are consider as a bone in Ayurvedic science are synonymous to cartilages described in modern medical science. It comes under 5 types of Asthi. Its locations mentioned in Ayurvedic text are Ghrana, Karna, Greewa and Akshikosh. The description of Tarunasthi is sporadic and scattered all over in Ayurvedic texts. In this review of applied part of Tarunasthi and its importance in Sharira has been discussed. BANARASE, Rahul Shamrao. CRITICAL ANATOMICAL REVIEW OF TARUNASTHI (CARTILAGE TISSUE) IN AYURVEDA. 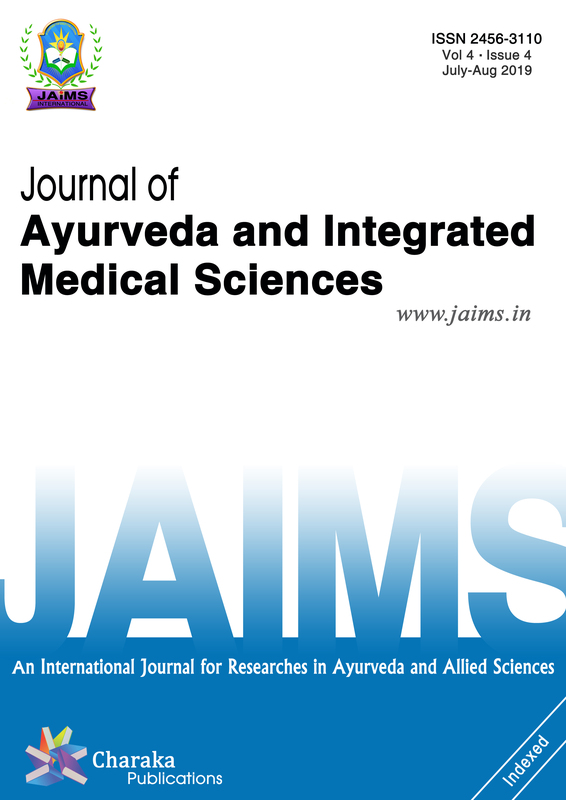 Journal of Ayurveda and Integrated Medical Sciences (ISSN 2456-3110), http://www.jaims.in/index.php/jaims/pages/view/Citation, v. 4, n. 1, p. 78 - 80, mar. 2019. ISSN 2456-3110. Available at: <https://jaims.in/index.php/jaims/article/view/768>. Date accessed: 25 apr. 2019. doi: https://doi.org/10.21760/jaims.4.1.16.